UN-HABITAT staff designed the school prototype and prepared cost estimates. An agreement was signed with each village to initiate construction works on nearby land from pre-Nargis school site but located within the school compound. The DRR on-the-job-training provided all the necessary technical knowledge to build natural disaster resistant schools. 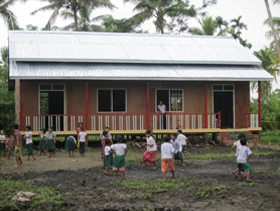 A semi-permanent school prototype was built with the participation of trained carpenters. 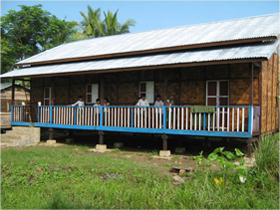 Size of a semi-permanent school was 45 by 26 feet built on stilts footing, timber frame, bamboo walling and CGI roofing. Substantial training and capacity building was conducted for women in the process of empowering and enhancing their skills and knowledge and has facilitated their involvement in different activities of the project in the field. Each School Construction Committee was formed by a chair-man, secretary and a treasurer, in all cases women were elected as treasurers. Monitoring had been on full participatory approach involving all stakeholders and beneficiaries. UN-HABITAT facilitators supported and trained communities on Community Contracts process and Community Contract awarded to a community to carry out physical works that have been identified in the Community Action Planning (CAP). Communities were at the centre of the process of decision-making and hence all project activities performed were recognized and owned by them. Final discussions were held between Shelter Construction Committees representing each village and UN-HABITAT staff to design the school prototype and prepare cost estimates. 22 semi-permanent schools built with the support of BASF Social Foundation and 5 with the support of Japan Habitat Association (JHA) in Pyapon, Dedaye and Bogale townships and these projects served more than 6,000 children. Project design was fully participatory where all stakeholders agreed on a proposal that should be child friendly, provide sufficient thermal comfort, fresh air, protection from the climate ensuring safety and health, minimize adverse effects on local environment, use local building practices reinforced with DRR techniques and maximize local livelihoods. Local communities were empowered. They are more aware, organized, and informed having substantial experience and exposure of decision-making and project implementation. Project ownership was highly achieved since it was the first time for communities to be involved they feel important as being part of their communities’ development. School Construction Committees kept communities very well informed about every single financial activity thus trust was built and there were no more doubts about money misuse. Training gave opportunity to literate and illiterate people to learn about DRR techniques that can be applied not only to school construction but as well shelter construction.